I feel it is every beauty lover's rite of passage to buy a MAC lipstick. Or even acquire a collection that defies all common sense and reasoning (you know who you are). I have a rather modest collection (compared to some I see out there), but I have given many away over the years or traded them in during the Back 2 MAC recycling program. So here is where I stand with my current MAC lipstick arsenal - a handful of nudes, raspberry pinks peppered in, a couple of violet/purple tones and some classic and standard reds that border on all time classics. 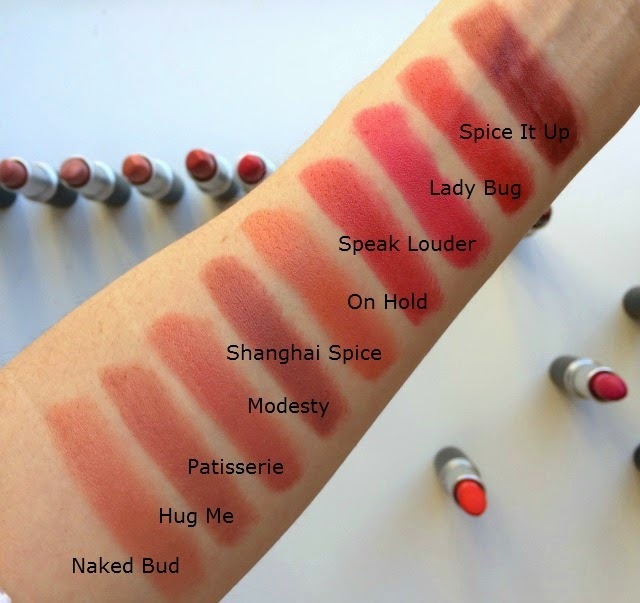 I have to be honest they are not my favorite lipsticks out there, but there is just so much buzz and hype around new launches and collaborations, that I find myself adding new ones all the time. MAC probably has one of the most versatile color ranges out there, so you are bound to find a shade to suit your needs. And if you don't, you must have some pretty specific needs! A few stand out favorites for me: Hug Me - the most easy breezy neutral, Modesty - an amped up everyday pinky brown lip color that gives a beautiful defined lip that I can wear with anything, Speak Louder - a vibrant raspberry that is summer time perfect, Ladybug - one of the most wearable reds ever and Spice It Up - a deep burgundy that is fall lip personified. The second round of swatches are all my bold MAC colors and ones that I don't reach for as much. A bold MAC color is BOLD. Pigmentation is never an issue with this brand. Girl About Town is an oldie but a goodie fuschia that makes a statement, while Lady Danger and Ruby Woo are two cult classic reds that everyone at one point should probably own - one has a vibrant orange undertone while the other has a decidedly blue undertone. 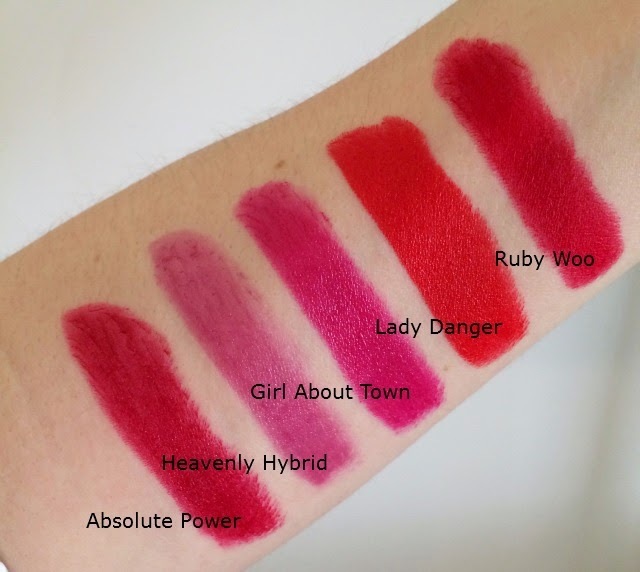 These are not wall-flower lip colors - these will get you noticed. That I know for sure. How many more will I collect? Hard to say - but there are already some new collections I have my eye on, so count on seeing an updated post at some post with a whole new crop of MAC lip colors. 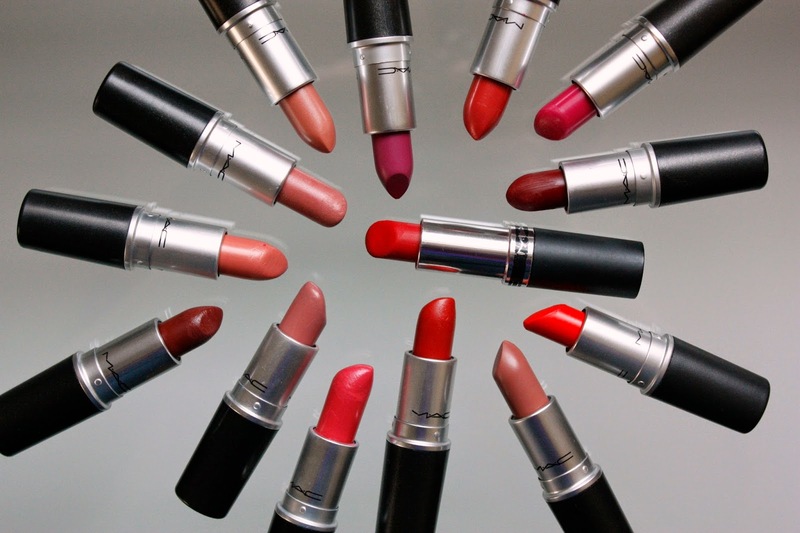 How large is your MAC lipstick collection? I am dying to know. I am sure some of you must have a separate storage unit just to house them.